A tarpon fishing charter at Boca Grande Florida is a truly unique experience and a “Must Do” on a fisherman's wish list. 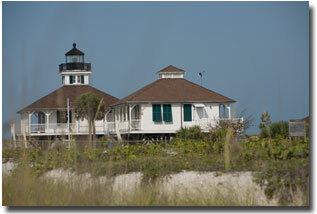 Boca Grande, on Florida's Gulf Coast, is the Tarpon Capital of the World. Each spring and summer, tarpon migrate to the beautiful waters of Boca Grande Pass and Charlotte Harbor in greater numbers than anywhere else in the world. The spectacle of this congregation of magnificent tarpon is one of the natural wonders of the marine world. To observe this event is a thrill in itself but to catch a tarpon is the ultimate fishing experience. Capt. Jeff fishes for giant tarpon at Boca Grande and Charlotte Harbor from April through July. 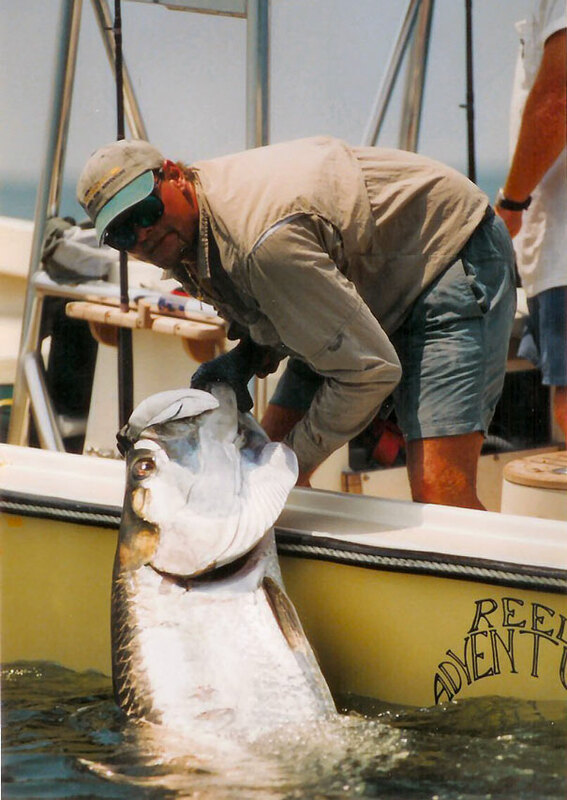 Join Captain Jeff for a tarpon fishing charter aboard his custom rigged tarpon boat “Reel Adventures” to experience one of the greatest fishing thrills in the world..
Tarpon, reverently known as the “Silver King”, deserves its status among the top game fish in the world. The brilliantly handsome tarpon is challenging to hook and is a tenacious fighter, making many spectacular jumps. 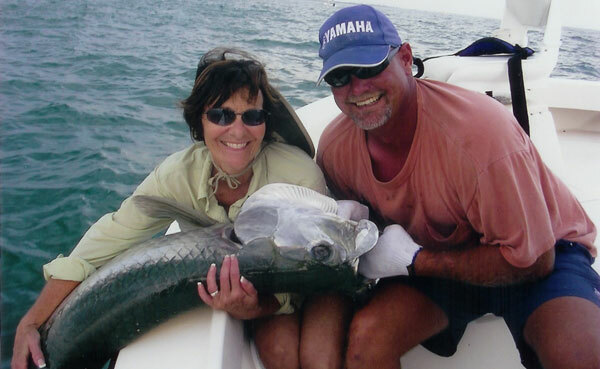 Couple that with the fact that the tarpon are very large and you have the makings of a fish story of a lifetime. The average tarpon is between 90 and 130 pounds. Last year Capt. 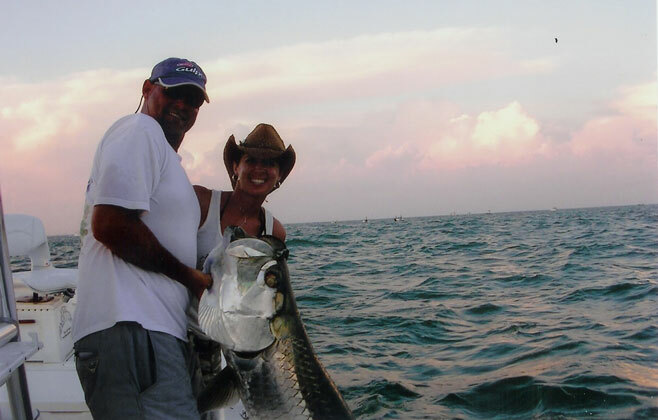 Jeff caught many giant tarpon over 150 pounds with several tarpon that weighed over 200 pounds. 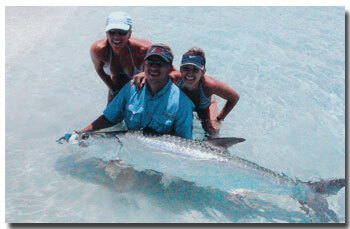 This is an exceptional fishery and there is a great demand for tarpon fishing charters at Boca Grande. You must book early. Boca Grande tarpon fishing techniques vary based on the tides, wind, moon phase, and customer preference. 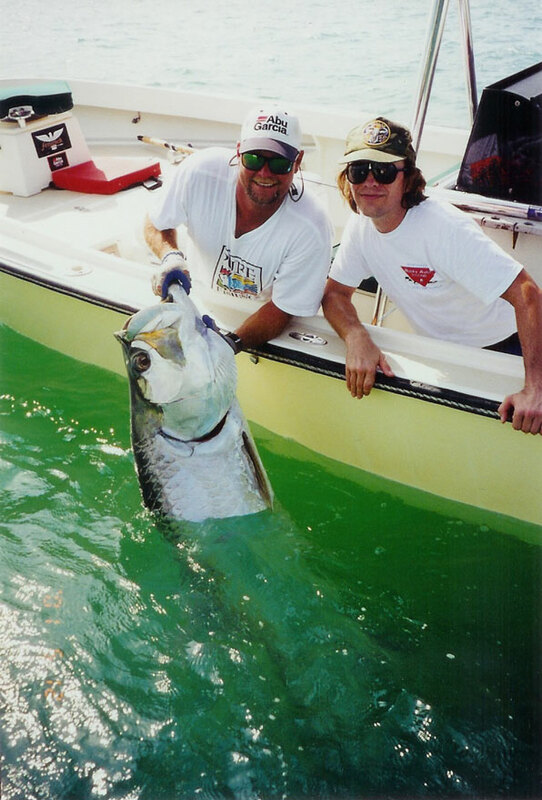 While the largest concentration of tarpon are in Boca Grande Pass from late April through July, you can also fish for tarpon along the Gulf beaches and on the flats of Charlotte Harbor and Pine Island Sound. While all these approaches can be very productive, Boca Grande Pass has the largest number of tarpon and will produce fish under the greatest variety of conditions. 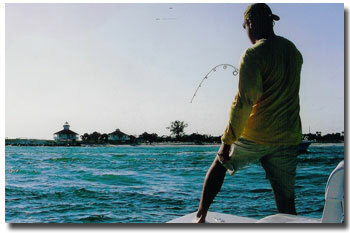 Pass fishing for tarpon is done with several different techniques using both live bait or artificial lures, and conventional or spinning tackle. Each presentation works, but knowing how, where and when to fish in a particular manner is what distinguishes the successful captains. Captain Jeff is a consistent top guide in the Professional Tarpon Tournament Series which pits the best tarpon captains in head to head competition. Whether its pitching a crab on spinning tackle, or dropping a bait or jig on conventional gear, Captain Jeff catches tarpon with all styles of fishing. 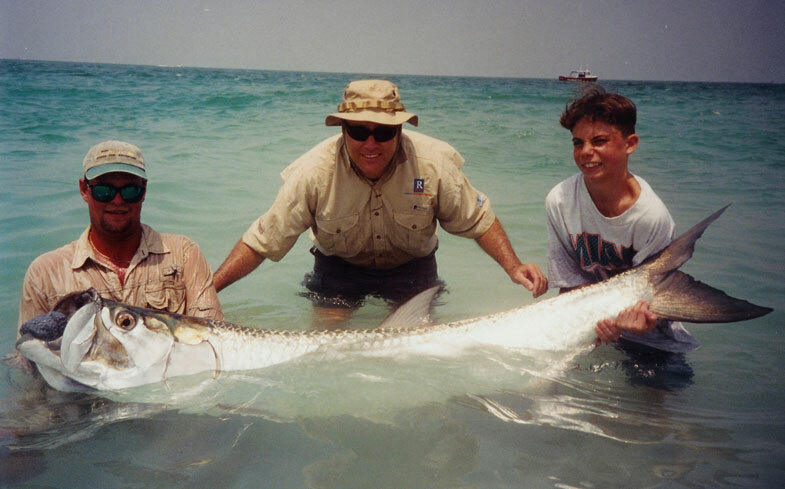 Beach fishing for tarpon is a sight fishing and waiting game and is best early in the morning on days when you have calm seas or a light east wind. Beach tarpon are sensitive to boat traffic and an outboard motor running down the beach will turn them off so it is best to be on the beach and either staked out or positioned in a tarpon transition area before the boat traffic picks up. As tarpon move along the beaches they can be seen rolling on the surface or appearing as a dark spot in the water moving along the beach. If the water is too choppy, dirty, or the sky is overcast it makes it difficult to spot tarpon along the beaches. My Boat is equipped with a tarpon tower and trolling motor which is a great advantage because it makes it easier to see fish from a greater distance and prepare our presentation. The excitement builds as the tarpon approach. You make your presentation well ahead of the fish. Muscle ready, senses sharp, a tarpon takes the bait and it is “game on”. 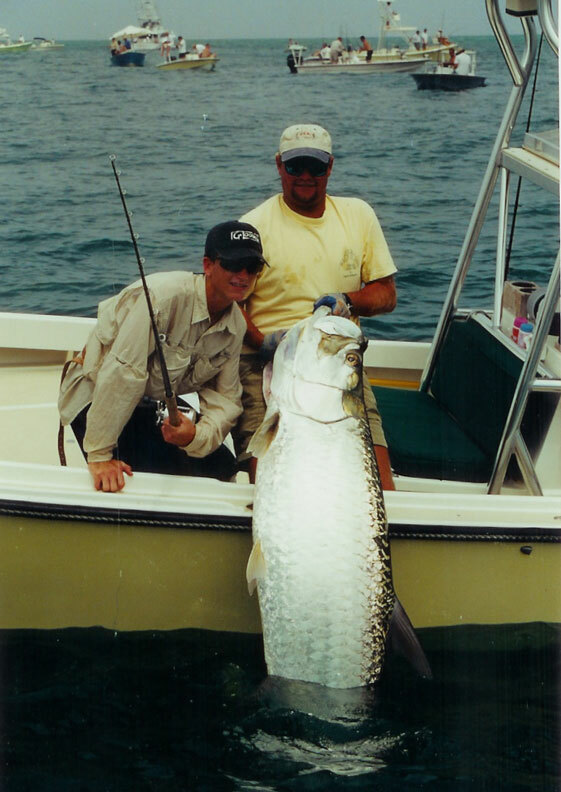 It is quite a thrill to battle a giant tarpon on the 20 pound spinning or plug rods we use for beach fishing. 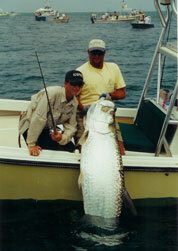 Tarpon fishing in Charlotte Harbor for laid up or rolling fish can be done with either live bait or artificial lures. Early season and some post spawn tarpon move up into Charlotte Harbor where they will stay there all summer until the cold fronts of fall drive them to warmer waters. The fishing in the harbor is more leisurely than pass fishing. The tarpon in the harbor are not as concentrated and can be very spooky in the shallow water. Once located these tarpon must be approached quietly. Drifting in an area of rolling fish and casting lures or bait to them is very productive. 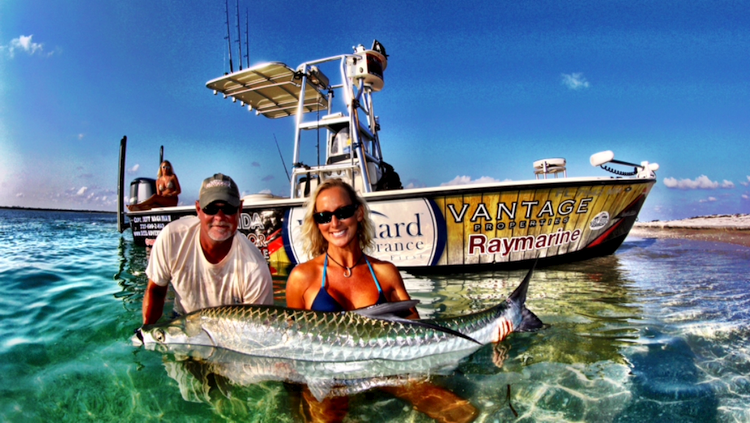 Click here to book a Tarpon Fishing Charter at Boca Grande for the upcoming season! 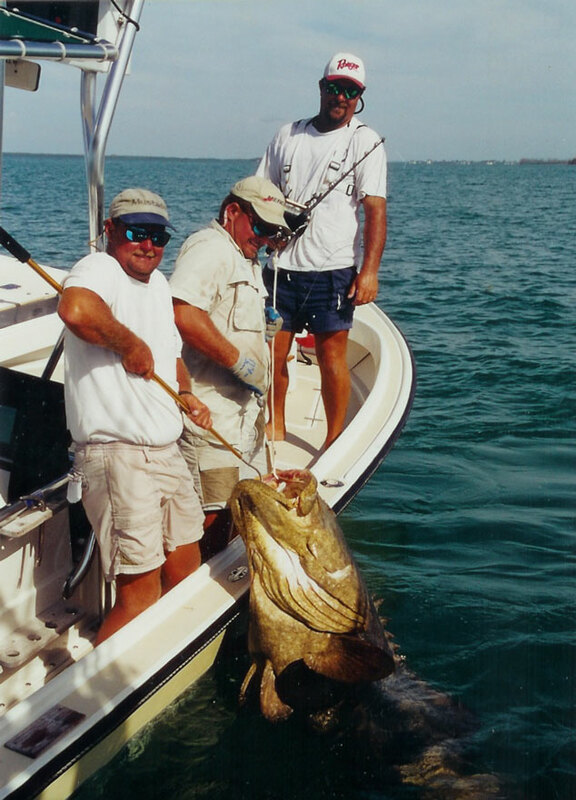 In addition to the awesome tarpon fishing at Boca Grande, the area offers exceptional fishing for Goliath grouper, permit, and snook, and sharks. 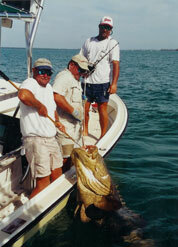 If you think Tarpon are large wait until you hook into a Goliath grouper. 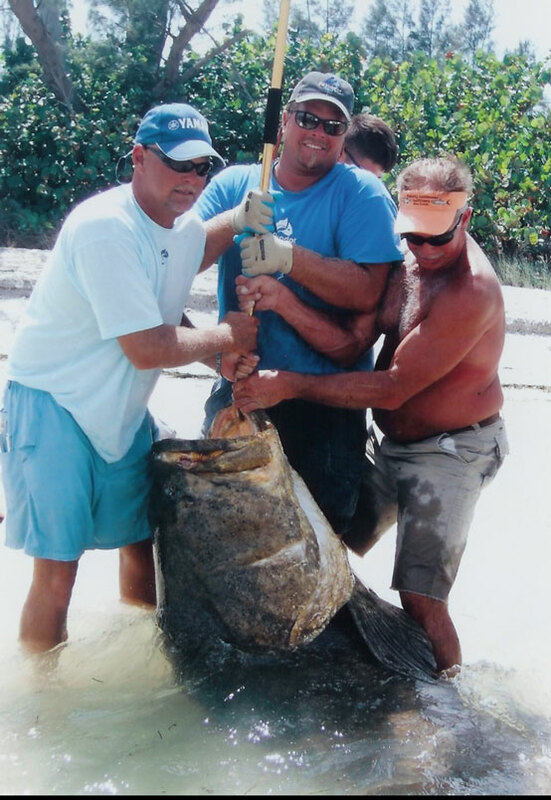 The Goliath grouper Captain Jeff catches at Boca Grande weigh from 200 to 600 pounds. To catch a fish of this size takes specialized tackle and a strong back. The permit fishing on the reefs and wrecks off Boca Grande is outstanding with permit running from 10 to well over 30 pounds. Snook fishing is at its peak from May through the summer, as the snook move to the passes and beaches in great numbers to spawn. Sharks are the tarpons major preditor and when the tarpon arrive so do the sharks, and lots of them. 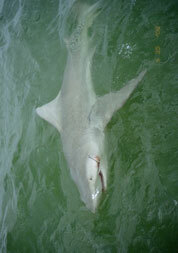 Giant Hammerhead sharks over 14 feet are regularly seen while tarpon fishing. Packs of Bull sharks to 500 pounds arrive to feed on the tarpon which they see as a giant sardine. 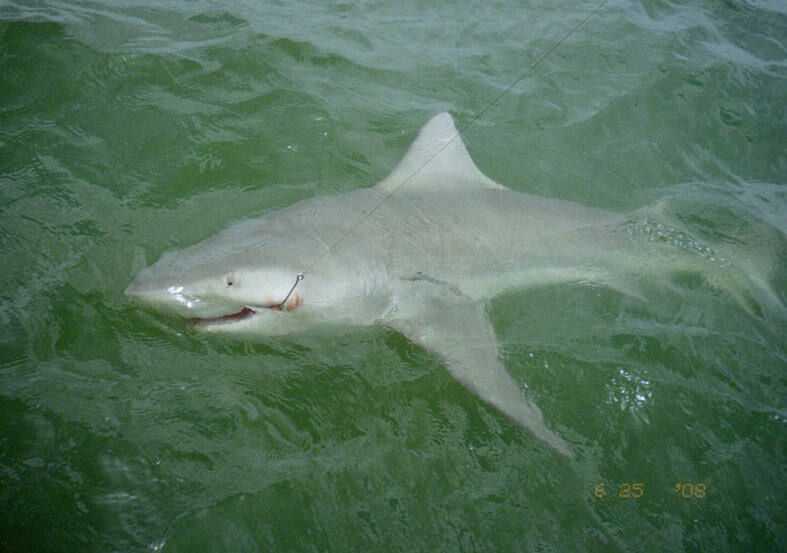 With such a congregation of large sharks, the shark fishing is great. 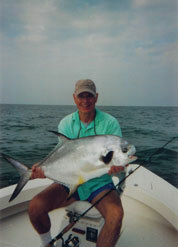 Ask Captain Jeff about a multiple day trip to take advantage of these outstanding fisheries. It is only fitting that the tarpon would live in the most beautiful surroundings. 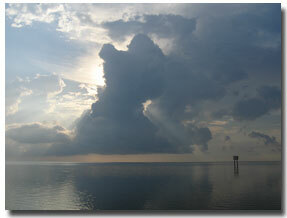 The undeveloped and protected national wildlife refuge of Charlotte Harbor is the spring and summer home of the “Silver King”. A day on the water in these surroundings is a treat in itself. The west coast of Florida abounds in marine life. 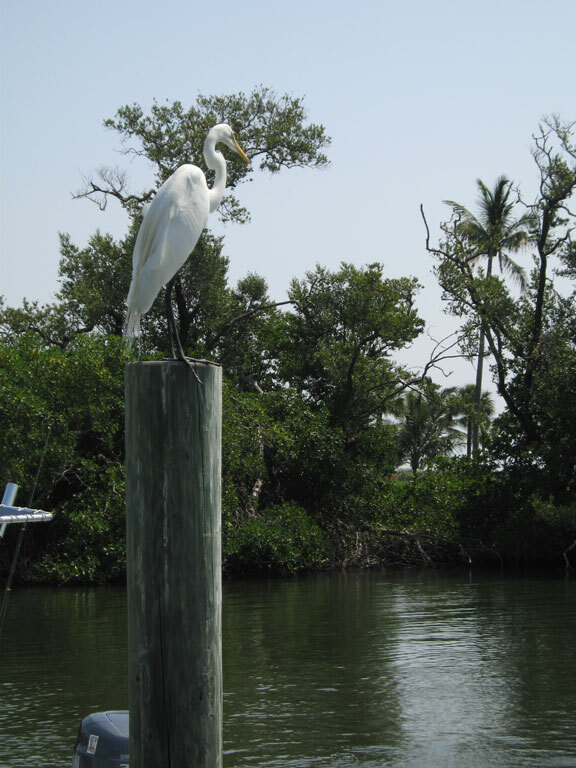 Dolphins, manatees, sea turtles, pelicans, bald eagles, ibis, ospreys, rosette spoonbills, egrets, herons, and countless seabirds make this estuary environment their home. Wildlife and plant life a abound in this environment. A boat ride to Cabbage Key for a “Cheeseburger in Paradise”, or a boat or kayak eco tour is a great way to spend a day. 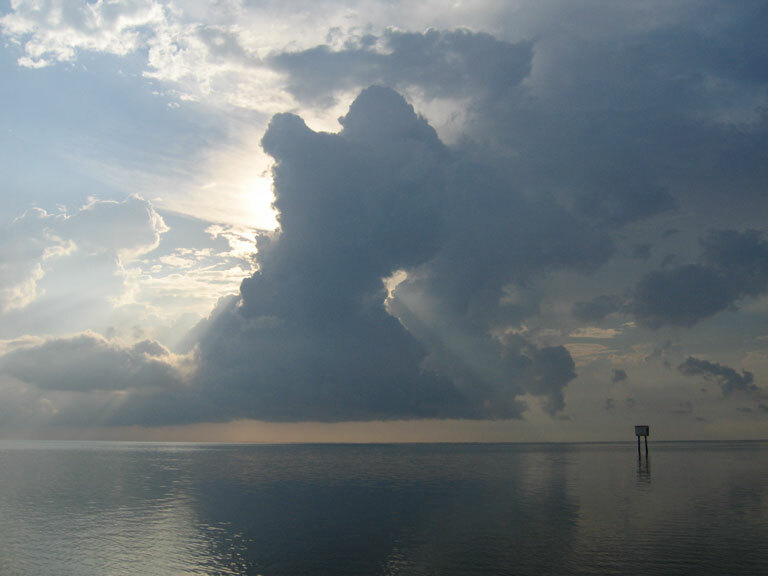 Gasparilla Island, the barrier island separating Charlotte Harbor from the Gulf of Mexico, is the home base for the tarpon fisherman. Tarpon fishing in this area goes back to the turn of the century. It is great to explore and learn of the history of tarpon fishing. 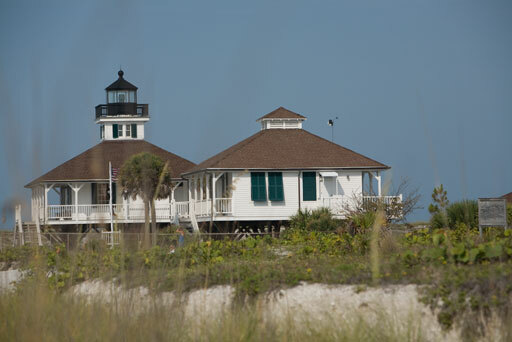 The historic Boca Grande Lighthouse and Museum, the oldest structure on the island, still stands sentinel over the tarpon fishing in Boca Grande Pass. Its exhibits recount the very beginning of tarpon fishing in this area. The small picturesque village of Boca Grande on the south end of the island retains the island charm of days past when the major events of the day were walking and shelling on the beautiful beaches or catching a tarpon. Gasparilla Island has some of the most beautiful and uncrowded beaches in Florida. Many shops and restaurants occupy the old train station and the village buildings built in the early part of this century. You will not find a stoplight once you cross over the bridge and travel back in time to this magical place. A bike, golf cart or walking tour is a laid back way to explore the island. The Gasparilla Inn, built in 1912 by Baron Collier to house his industrialist friends from the north on their tarpon fishing quests is still in operation in grand fashion. The Inn has a golf course and tennis club. This historic Inn has been welcoming guests since 1912. Excellent service, food and an 18 hole golf course. Harbortown Villas are one becroom villas located at Palm Island Marina. Also accommodations on Palm Island at the resort.